With tuition costs rising in recent years, making the right choice for college has become more difficult than ever. We are pleased to announce that the School of Automotive Machinists & Technology has received this distinguished award. Investing in your future is an important decision. SAM Tech’s Financial Aid Department will help find the best options for you. Your personal finance plan could include grants, scholarships, student loans and parent PLUS loans for those who qualify. SAM Tech is also approved to train VA eligible persons. Let us help you choose the most affordable pathway to your goal. SAM Tech is a military friendly school. Launch your career from the Military to the Motorsports Industry. 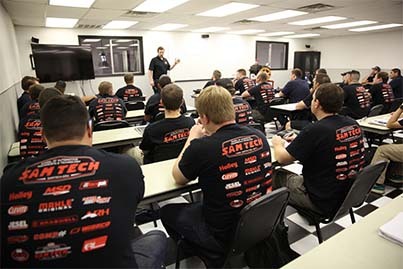 SAM Tech graduates work for some of the top engine builders, champion race teams, and motorsports industry leaders. Our graduates step directly into the racing industry with highly respected employers throughout the country. Accelerate your career by enrolling today. See SAM Tech students’ work in action with up-to-date race results, specs and pictures from Team SAM Tech. Here at the School of Automotive Machinists & Technology (SAM Tech), we help you get the hands-on training you need to jumpstart your career. Building engines isn’t for everyone. It’s only for the best. And we help place the best automotive machinists in top teams across NASCAR, NHRA, and IndyCar. We help you power those teams to victory every race. Every weekend. Our list of employers is competitive, and we can help you live your dream! SAM Tech’s unique curriculum is dedicated to building better race engines. Our intensive hands-on programs cover engine block machining, short-block assembly, and cylinder head porting. We will teach you how to extract maximum horsepower for all types of applications. helped me find a job back home and I couldn’t be happier." helped me be able to afford my education from SAM." The School of Automotive Machinists & Technology (SAM Tech) is a provider of machining and technical education training for students seeking careers in the high performance racing industry. Located in Houston, Texas, SAM Tech offers programs in Engine Block Machining, Cylinder Head Machining, CNC Machining, EFI Tuning, and Associates Degree classes. SAM Tech graduates are hired by the best in the performance racing industry, whether that's on championship teams in NASCAR, NHRA, and IndyCar, or the best in automotive manufacturing including GM, Ferrea, CP-Carrillo, Wiseco, and many others. School of Automotive Machinists & Technology School of Automotive Machinists & Technology shared a post. School of Automotive Machinists & Technology School of Automotive Machinists & Technology is with MAHLE and 5 others at School of Automotive Machinists & Technology. School of Automotive Machinists & Technology School of Automotive Machinists & Technology is at School of Automotive Machinists & Technology.